Even if you have a definitive budget, scheduling your shoot schedule can be tricky. You need to break down all the elements of your film to determine how to distribute the money you have. These breakdowns also help you figure out how many days it will take to shoot your film. You have to make your budget fit your schedule, so be prepared to do some juggling. If you’re on a tight budget, you won’t have the luxury of shooting your film over a period of several months. Your budget may only allow you to schedule a 12-day shoot (every additional day is going to cost you money). Juggling includes consolidating scenes. If you can shoot the scene in the cave in two days instead of three, and the breaking-up scene in the car, instead of in the shopping mall, you’ll be able to shorten your schedule — thus, saving time and money. Lining the script by going through and marking items such as actors, props, wardrobe, and special effects. Putting those items on individual breakdown sheets, each representing one scene from the film. Transferring the elements on the breakdown sheets to production board strips. Rearranging the order of production strips to find the best shooting schedule. A calendar is your best friend when scheduling your film. You choose the date on which to start principal photography and the date on which the shoot will wrap. By looking at a calendar, you see what days the weekends fall on and whether any statutory holidays occur that the cast and crew will have off (like Christmas and Memorial Day). After you highlight the various categories of items, transfer the highlighted elements to individual breakdown sheets — one for each scene in your film. A breakdown sheet contains separate drawn category boxes to add the elements you’ve highlighted in the script. You enter each element in the appropriate category box, such as a hammer in the props area, either by hand or by using one of the available software programs. Each breakdown sheet should be numbered so that you can go back and reference it if you need to. Every character in the script is also given a reference number, usually starting with the number 1 for your lead actor. You transfer these numbers to the breakdown sheets and eventually to the individual strips on the production board. Numbering saves space so that you don’t have to keep writing the characters’ names (plus there wouldn’t be enough space on a strip). Figure 1 shows a sample breakdown sheet from the film The Dragon’s Candle. Scene 106 has Ghandlin the wizard driving a borrowed police car and zapping traffic out of his way with his magic wand. 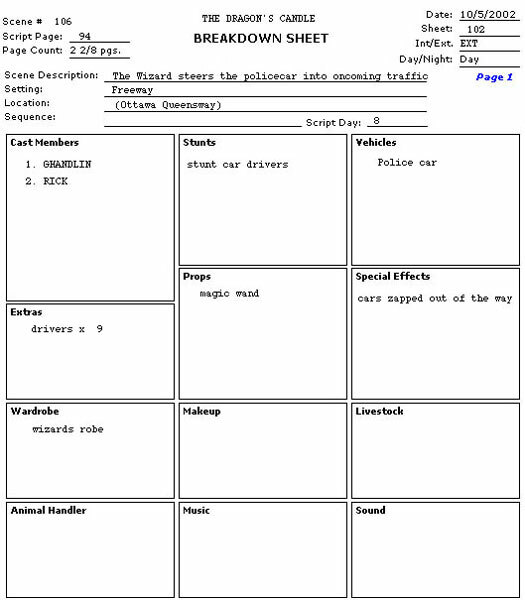 The breakdown sheet provides separate boxes listing the elements that are needed for this scene. Every prop that will appear in your film must be pulled from the script and added to the props category in your breakdown sheets. A prop is defined as anything your characters interact with, such as guns, cell phones, brooms, and so on. On a low-budget film, try to borrow your props — especially if they’re contemporary items. For hard-to-find props, you can usually rent them from a prop house or rental house listed in the Yellow Pages or the 411 directory in New York and Los Angeles.In North Hollywood, California, 20th Century Props has over 100,000 square feet of storage that houses thousands of props. Often, props are confused with set dressing, but the difference is that actors don’t interact with set dressing. Set dressing includes a picture frame on a mantle or flowers in a vase on a table. The baseball bat in Mel Gibson’s film Signs would have been categorized as set dressing, but because the actors actually interact with the bat (which is displayed on a wall), it is categorized as a prop. You address set dressing in your breakdown sheets only if it’s crucial to the story. You add certain wardrobe elements to your breakdown sheets, such as costumes, uniforms, or clothes that have to be sewn from scratch. A character’s jeans and T-shirt don’t need to be entered in the wardrobe box, but a gangster’s zoot suit does. Because scenes aren’t usually filmed in chronological order, each outfit is given a script day number to ensure that the actor wears the correct wardrobe in each shot. Script days (the timeline of your story) will be part of the breakdown sheets, and if the story takes place over five days, you’ll sit down with the wardrobe person and decide what clothing your actors will wear each day if it’s not addressed in the script. You can list your location setting in the heading of each breakdown sheet. Locations dictate a lot regarding scheduling and budget. If you’re using software like Movie Magic Scheduling, you can cross-reference details about the locations (Are they private or public property? Do you need to secure permits or pay location fees, and how much do they cost?). Keep your locations to a minimum; otherwise, you may end up going over budget. You can stretch your entire budget if you decide to shoot outside the United States. Shooting in Canada, depending on the exchange rate at the time, can stretch your budget up to 45 percent or more! Don’t plan to head north of the border without doing some research first, though. Many states in the United States offer incentives to encourage filmmakers to shoot in their cities. Scheduling special effects on your breakdown sheets helps you determine what kind of effects you can afford. Keep effects to a minimum if you’re working with a lower budget. You may find that designing special effects on a computer fits within your budget better, depending on how elaborate the special effect.